The Christmas cosmetics have been cleared from the shelves, and there are all kinds of new products at my local Walgreens! 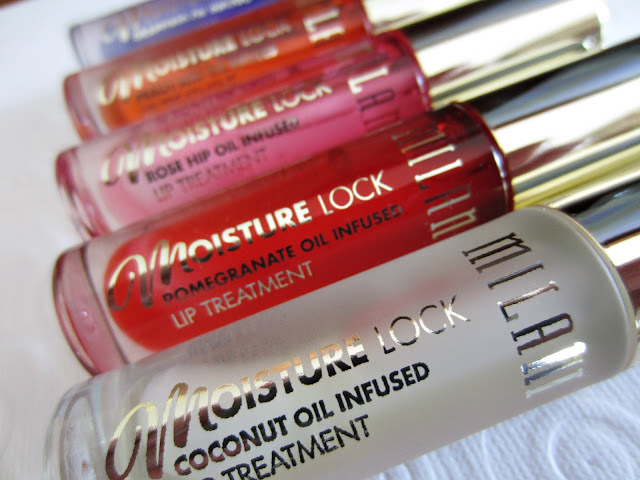 Milani Cosmetics leads the way with a dozen new items, all of which can be viewed on their web site here. I picked up some of their new eye shadow palettes, along with 5 of their new Moisture Lock Oil Infused Lip Treatments. There are 8 different treatments available, and the ones I did not pick up are Raspberry Oil, Grapefruit Oil, and Lemon Oil. These retail for $7.99 each, and there is 0.10 oz. of product in each tube. The tubes themselves are quite substantial, measuring 3/4" in diameter and 3.5" in length. The display notes the target area for each treatment, such as infused with Vitamin E, rich in anti-aging properties (Peach Seed Oil Infused), or infused with Vitamins A & E, softens the appearance of wrinkles (Rose Hip Oil Infused). Below are photos of the huge doe-foot-type applicator, and a side by side with a Cargo brand lip gloss to show a size comparison. 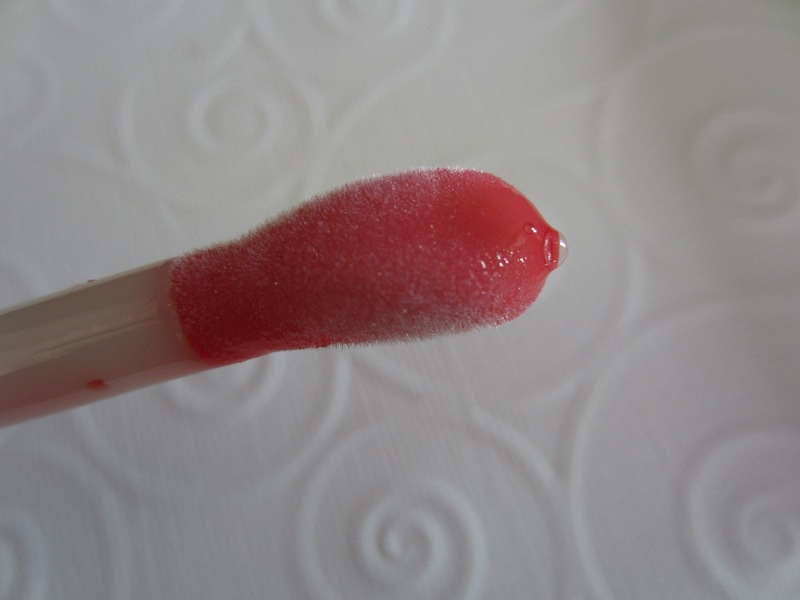 The shaft and the applicator are nearly 2-3 times the size of half a dozen other various brands of glosses I pulled out to compare these to. It doesn't hinder the application with such a large size, but it certainly leaves a vast visual and physical void of product once it's pulled from the container. I pulled all of them out and let them settle for a couple of minutes, and the base container is about half full without the wand applicator. Now let's talk color pay-off. There really is none, and I didn't really expect there to be much, although a hint of color would've have been nice. 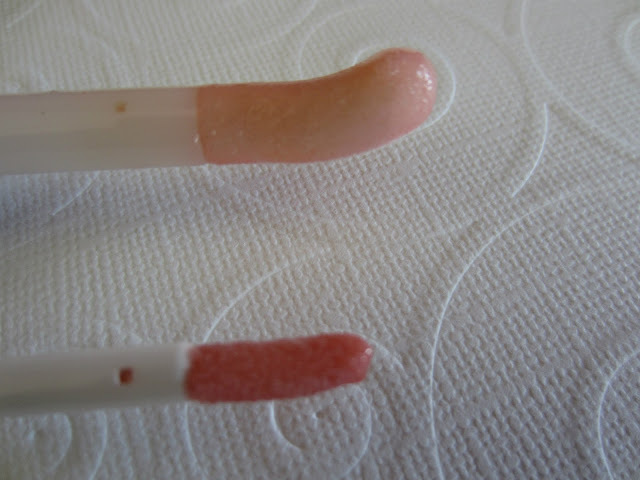 The bottom swatch is Pomegranate, and while you can see a touch of color, it doesn't really transfer to the lip. The other shades from the top are Grapeseed, Peach Seed, and Rose Hip. I didn't swatch the Coconut, the obvious clear one, but yes, they all look basically the same. I picked these up last week, and have been using a different one each day, several times a day. I really don't notice any difference in each individual one's treatment properties. I was hoping one or two might stand out for me, but honestly, they all seem the same. They are all scented to their names, and while none of them are off-putting or overbearing, the Peach Oil and Pomegranate are my favorites in that department. Color-wise there is no difference, texture/feeling on lips there is no difference, performance-wise based on their description, there is no difference. 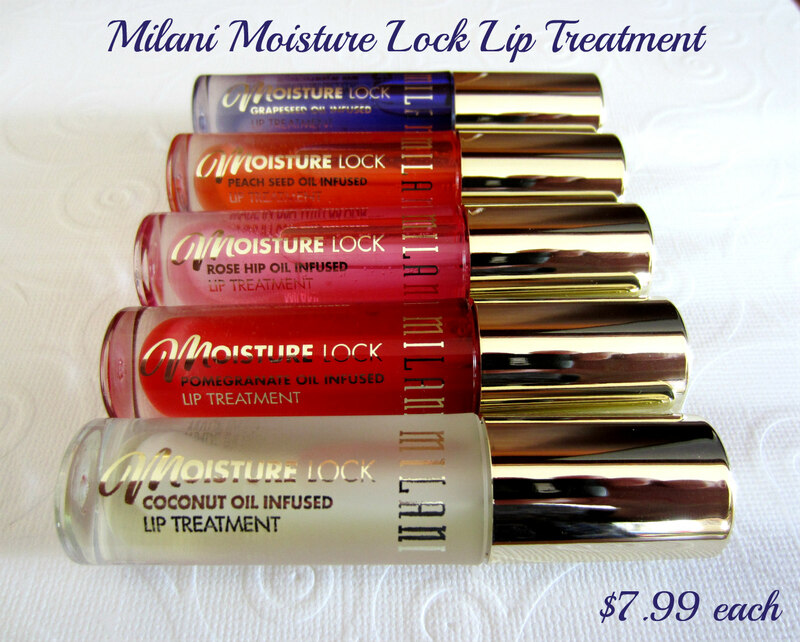 You can view the ingredient list on Milani's web site. 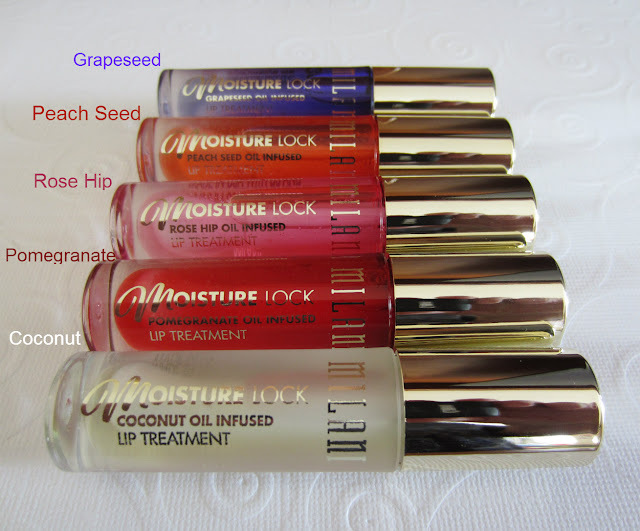 These are extremely similar to Clarins Instant Light Lip Comfort Oils in the packaging design and intent in my opinion, but they are quite a bit less expensive for the same size product. The Clarins product is similar in feel once applied, perhaps ever-so-slightly thicker, but it also lasts longer on the lips. The Milani product has a bit lighter feel, but I find myself applying it at least every 2 hours, while the Clarins product lasts about 4 hours for me. My lips feel and look much more nourished with the Clarins, while the Milani simply makes them feel moisturized while wearing it, but really doesn't improve the look. The Clarins product has a stronger scent, so I prefer the Milani scents in that respect. These do feel nice on the lips, and they impart a very glossy look initially, but that settles to a semi-glossy look and an almost balm-type feeling after about 15-20 minutes. I can't say that my lips feel any better or worse after using these for 5 days, so my final verdict is basic indifference with a hint of disappointment. Raise your hand if you are always applying something to your lips, because I am that person too. I have at least 3-4 other similar products here on my desk at all times, so I will use these up. As pretty as they look sitting here however, I don't see a need to repurchase them when they're gone. @Florence-Yep, there's nothing wrong with them, but I just didn't feel they were unique in any way.